'Dust Storm', 'Magnetic Storm', 'Ocean Storm', 'Thunder Storm' and 'Pyro Storm'. adidas has taken us through all these occurring storm phenomenons, and today the german brand presents the final storm. Check out the 'Earth Storm' Pack right here. 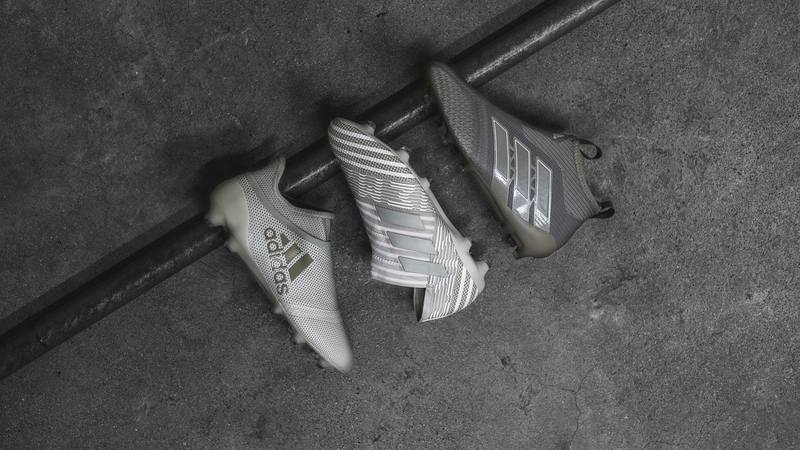 The final storm brings us the same technologies as in the previous packs, meaning that you'll get the same features on the ACE, Nemeziz and X that you've seen on the 'Pyro Storm'. On the other hand, the 'Earth Storm' Pack provides a very clean look with some stylish colourways for the three boots. Starting off with the adidas X 17+ PureSpeed, which is mainly dominated by the trademark polka dot pattern and a gray white and gold paint job. A boot made for the pacy winger burning past defenders, turning an inch of space into a chance, and finish in a flash. If you take a look at the Nemeziz 17+ 360Agility created for the supernatural agile player, the colour is brighter and the design features a subtly striped upper in beige tones, combined with tonal Three Stripes on the outstep and a slightly lighter sole. Finishing with to the boot of the playmaker, the ACE 17+ PureControl. The cleats come in an astonishing colourway in shades of grey and sesame brown, with subtle brandings and a low-key knit pattern on the upper. Once again, adidas has really hit the spot with the ACE, and this will for sure look very neat on pitch. A Unisport HQ favourite like often before. Get the boots from the adidas 'Earth Storm' Pack right here.